As an Active Directory administrator, you may be tasked with ensuring that your company's password policies are met by certain users. This can include enforcing a password requirement, a password expiration date, and a maximum password age. 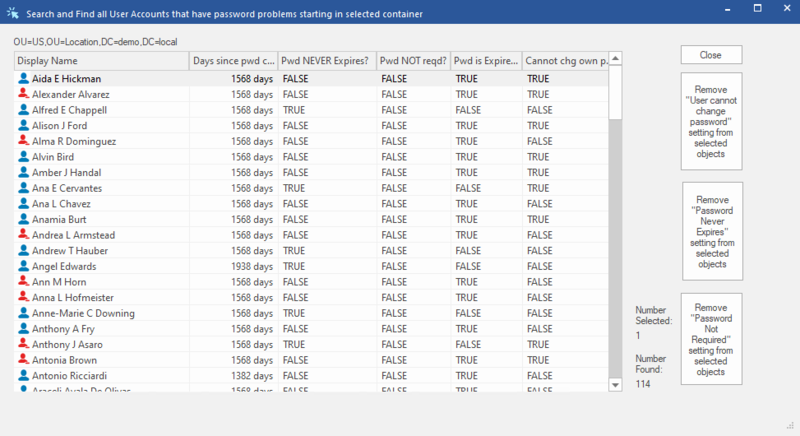 DSRAZOR for Windows allows you to quickly report on the status of common flags of the userAccountControl attribute, including "Password Never Expires," "No password required," "User cannot change password," and the number of days since their password was last changed. DSRAZOR then allows you to easily modify the common userAccountControl flags pertaining to password policies to ensure all user accounts are in compliance. Find Active Directory user accounts whose password settings do not match your company's password policy with DSRAZOR for Windows. Including "Password never expires", "Password is expired", "No password is required", and "User cannot change password"
Easily ensure user account passwords match your company's policy by modifying password settings directly from your report!